Description Bleomycin Sulfate is a glycopeptide antibiotic and an anticancer agent for squamous cell carcinomas (SCC) with IC50 of 4 nM in UT-SCC-19A cells. 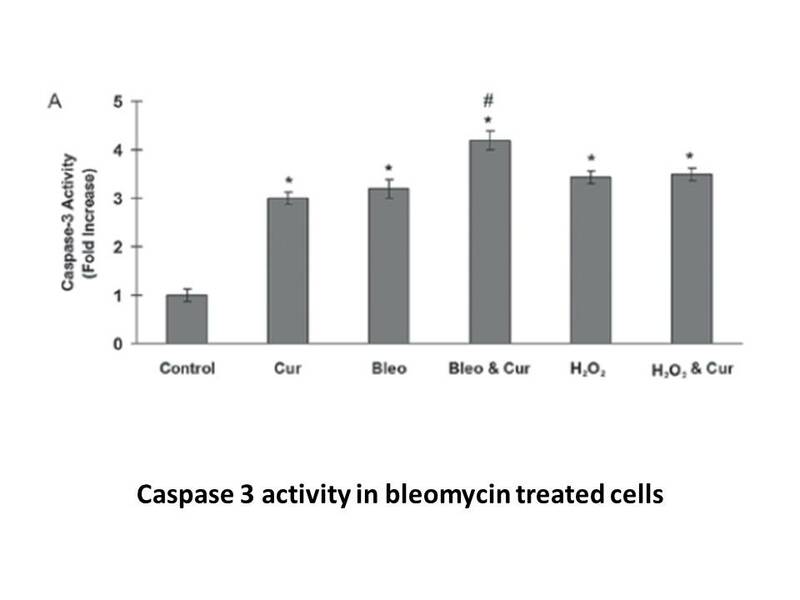 In ADIPO-P2 cells, Bleomycin Sulfate showed significant clastogenic effect, which even lasted for at least 10 days after exposure. Bleomycin Sulfate promoted the development of inflammation, resulting in severe pulmonary fibrosis, as well as simultaneous increasing of TGF-β1, Smad3 and STAT1.
. Paviolo NS, Quiroga IY, Castrogiovanni DC, Bianchi MS, Bolzán AD. 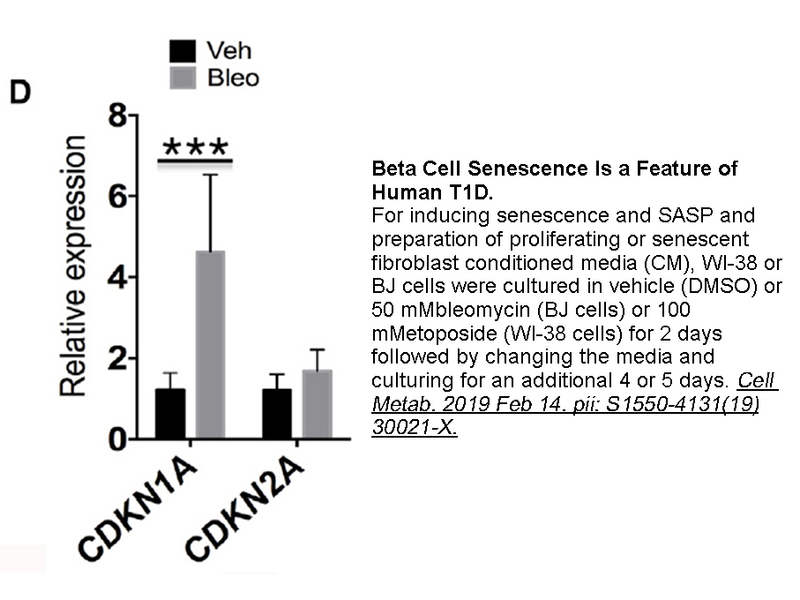 Telomere instability is present in the progeny of mammalian cells exposed to bleomycin. Mutat Res. 2012 Jun 1;734(1-2):5-11.
. Shi K, Jiang J, Ma T, Xie J, Duan L, Chen R, Song P, Yu Z, Liu C, Zhu Q, Zheng J. Dexamethasone attenuates bleomycin-induced lung fibrosis in mice through TGF-β, Smad3 and JAK-STAT pathway. Int J Clin Exp Med. 2014 Sep 15;7(9):2645-50. 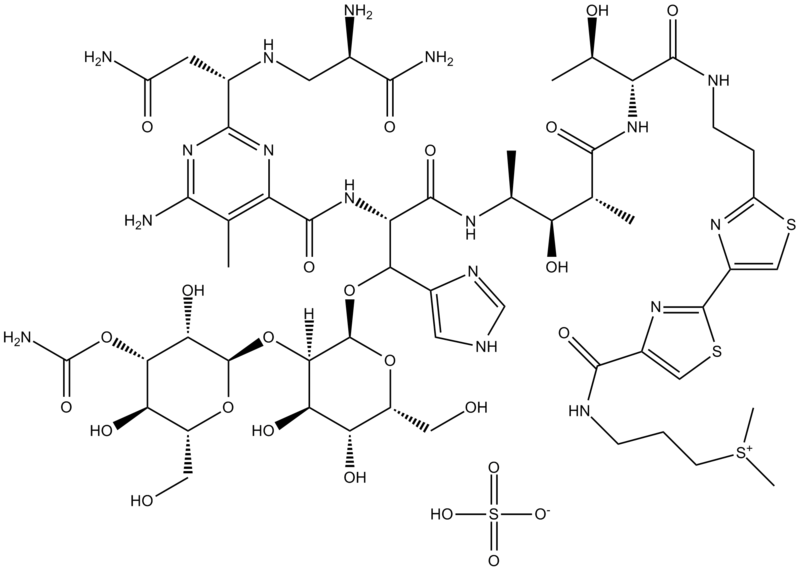 Bleomycin sulfate (BLENOXANE®) is a mixture of cytotoxic glycopeptide antibiotics produced by a strain of streptomyces verticillus. This component is known to cause single and/ or double-stranded breaks in DNA through approximating metals and coordinate dioxygen to generate the active species. 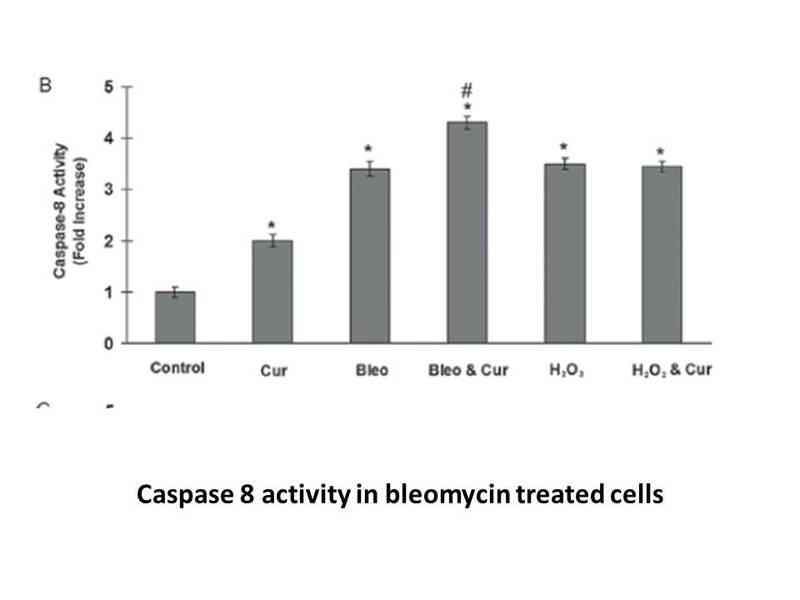 Bleomycin sulfate treatment resulted in elongation of E. coli cells and enlargement of HeLa cells through inhibiting DNA and protein syntheses . moderate to marked effects upon Rous sarcoma virus induced mouse ascites sarcoma, particularly when F1 hybrid mice were employed as host animals . In addition, recent studies support the role of the proinflammatory cytokines IL-18 and IL-1beta in the mechanism of bleomycin sulfate –induced human and mouse lung injury . 1. Suzuki H, Nagai K, Yamaki H, Tanaka N, Umezawa H. Mechanism of action of bleomycin. Studies with the growing culture of bacterial and tumor cells. J Antibiot (Tokyo) 1968,21:379-386. 2. Takeuchi M, Yamamoto T. Effects of bleomycin on transplantable mouse tumors. J Antibiot (Tokyo) 1968,21:631-637. 3. Hoshino T, Okamoto M, Sakazaki Y, Kato S, Young HA, Aizawa H. Role of proinflammatory cytokines IL-18 and IL-1beta in bleomycin-induced lung injury in humans and mice. Am J Respir Cell Mol Biol 2009,41:661-670.